In 2001 Ralph Peterson debuted on Criss Cross with The Art of War, returning to the quintet format that marked his earliest recordings. 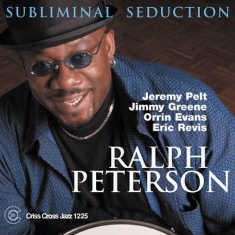 The same powerful lineup was back in the studio that same year for more on Subliminal Seduction. Featuring nine new originals, one standard, and one cooker by trumpeter Jeremy Pelt, this album documents the ongoing evolution of one of the finest drummers and bandleaders of our time. The sidemen: Jeremy Pelt on trumpet, Jimmy Greene on tenor and soprano sax, with pianist Orrin Evans, and bassist Eric Revis.